WATROUS, NEW MEXICO, US, November 8, 2018 /EINPresswire.com/ -- The program, now in its fourth year at the historic northern New Mexico National Monument, is a successful cooperative venture between the National Park Service and The National Parks Arts Foundation to bring a variety of artists to work and live at the monument, and make a public presentation. 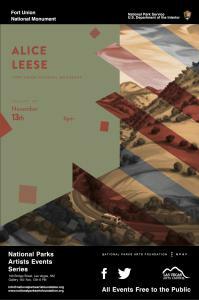 Alice Leese, who is both an accomplished artist who works her family ranch in Winkler County, Texas, which shares the southeast corner of New Mexico south of Jal, as a border, will be coming to Fort Union this coming month to bring her unique and expressive style to bear on the amazing landscapes of New Mexico in the fall. The artist, selected by a panel of judges, will spend the beautiful late fall months at the historic Northern New Mexico monument. 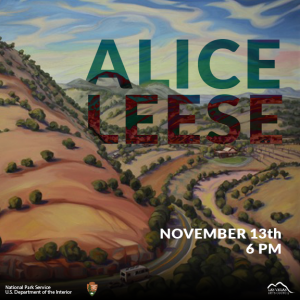 Alice Leese will be doing her first public presentation on Friday, November 9th, at 1 PM, at the Monument’s visitor’s center. She will be following up that with another on November 13th at 6 PM at Gallery 140, 140 Bridge St. Las Vegas, NM, sponsored by the Las Vegas Arts Council. Alice, raised on the ranch which has been in her family for 100 years, says that the solitude and rhythm of this particular landscape is essential to how she approaches her art: “Living out here has also given me a frame of reference for time and patience, some days we are horseback from sunup to sundown, ranches here are large and pastures are sometimes 15 square miles, it takes some patience to not rush the cattle, they go at their pace and we just follow when we are rounding-up or working them.” She says that the ranch is very remote, and even requires the occasional climb on a windmill to grab spotty cellphone reception. Though she loves being a managing partner at their ranch, she often doesn’t get the focused time to paint, so being able to focus for a solid month on her art is an amazing opportunity that she will make the most of. In addition to her full time job, she is also completing an M.F.A. at the same time. Fort Union National Monument, located in Mora County near Watrous, New Mexico, was the largest frontier military post and supply center of the southwest. It also was the hub of commerce, national defense, and migration at the final stretch of the Santa Fe Trail. The richly evocative remnants of a post-civil war era adobe fortbecame a National Monument in 1954 under the Eisenhower administration.